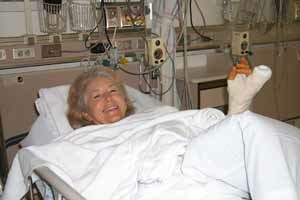 This is an actual patient in the recovery room, minutes after surgery on her hand. She is smiling because she doesn't hurt, and she doesn't hurt because of my post-operative pain program. I am "allergic" to pain, and I presume that you are, too! Your post-operative pain is important to me. Please read on. Is this about what you would say? I think it is exactly what I would want from my own surgery. Doctors spend a lot of time making sure the surgery is successful, and they spend a lot of time trying to avoid complications. But they tend to ignore the patient's pain. I don't think ignoring pain is what patients want. It is certainly not what I want from my own physicians. So I have been studying post-operative pain since 1989. I joined the International Association for the Study of Pain (a professional organization of doctors, principally anesthesiologists, and PhD's), bought and studied books on pain, subscribed to a pain journals, attended pain lectures, and talked to pain specialists. Based on this work, I designed a post-operative pain program for my hand surgery patients, and when I had surgery on my own hands (carpal tunnel releases, both hands, same day), this is what I used for my own pain. I have performed two prospective studies of the effectiveness of this pain management protocol and presented them at international, national, and regional surgery meetings. The first study, done in 1999, was a three-year, prospective study of the success of my post-operative pain program on my own patients (all conditions) and presented this study at the International Association for the Study of Pain, at the American Society for Surgery of the Hand, and at a variety of regional surgery meetings. The response from specialists in pain management has been very positive. The second study, done in 2013, was a prospective study a series of 59 distal radius fracture patients, which was presented at the 2013 UCSF Orthopedic Department's Annual Research Meeting, and which was presented at the September, 2013, annual meeting of the American Society for Surgery of the Hand. The goal of the study was to evaluate the effectiveness of our current post-operative pain protocol by measuring patients' post-operative pain after all kinds of hand surgery. It is very difficult to measure pain, since it is essentially a subjective perception, a private experience that you can try to explain to someone else but you never fully can. It is your private perception. Real, but subjective. I spent some time trying to figure out how to measure post-operative pain: visual analog scales, numbering scales, etc. The method of the study that I finally decided upon was to allow the patients unlimited access to narcotic pain medication and just count the number of pills taken in the post-operative period (10 days) before they saw me in the office. This method (measuring the amount of narcotic pain medication) has been used in many studies of other parts of the body and is widely supported as an effective way of measuring pain. The study was approved by the Institutional Review Board of Marin General Hospital. I used the pain management protocol listed below (see yellow box, below), with slight changes over the course of the study (eg, substitute a COX-2 inhibitor for Motrin, call the patient the day after surgery rather than the evening of surgery). The results of the study: We collected data for over three years (the study started December 10, 1998). At the three year mark, the average number of Vicodin or Tylenol #3 taken, for all patients, was only a total of 2.26 pills within the first 10 days after surgery, and 46% of the patients did not take any narcotic medication, only antiinflammatory medication such as Celebrex plus Tylenol (acetamenophen). That's all! I think, and my surgery colleagues agree, that this is a rather dramatically low number. (We do not have a control group, but many surgeons are giving their patients 30 or 40 narcotic pills for the same kinds of surgeries.) For surgeries involving only soft tissue (like carpal tunnels, trigger fingers, Dupuytren's releases), the average was only 1.1 Vicodin pills in the first 10 days after surgery; the average for bone procedures (like fixing fractures, correcting malunions, etc) is 6.1 Vocodin pills. I have slightly modified my techniques since the 1998-2000 study (improved post-operative injection of long-acting pain medicine, substitute long-acting Tylenol Arthritis for short-acting regular or extra strength Tylenol), and currently 72% of the patients find that they have so little pain that they do not want to take any Vicodin, only the Tylenol and Celebrex. We estimate that the average total number of Vicodin taken is now less than 1 pill in ten days. This was a study of 59 consecutive patients who had surgery for a distal radius fracture. This particular surgery was chosen for study for several reasons: (1) it is moderately painful, so it is a good test of my pain management protocol; (2) it is common enough that we could get a large number of patients to study; and (3) all surgeons around the world do it in a very similar manner, so other surgeons could use it in their own practicies to assess how well they are managing pain. The protocol was the one listed below (see yellow box, below). The method of measuring pain was the same as the 1999 study, we asked the patients how many of their Vicodin that they needed for pain relief. The results of the study: The average number of Vicodin taken within ten days of surgery was 0.68 pills. That's right: less than one! Seventy-two percent of the patients never took one. Remember, all of the patients were given a prescription for 5 Vicodin and had to fill it before surgery, and were promised as many refills as they requested. They had the Vicodin ready at hand, to take if they had pain. They could have taken more if they wanted to. However, the patients had so little pain that 72% did not take a single Vicodin. For comparison, in a study of 30 hand surgeons around the US that I did in 2013, the average number of pain pills prescribed for distal radius surgery was 41.5, and the most commonly prescribed pill was Percocet (much stronger and more addictive than Vicodin). This is pretty strong proof: the pain management program I use in my practice is very effective. I cannot predict the future for your surgery, but I can remember the past: 72% of my patients who had a moderately painful surgery never needed a single Vicodin, and the average number of Vicodin taken was 0.68 in ten days. How can I make my surgeries hurt so little? Here's the secret: listen to your patients, and then act on what you hear. That's all there is to it. The patients take Aleve 220 mg (a long-acting medication, not Advil or Motrin, which are short-acting) or similar antiinflammatory medication, AND (please note that this is "and", not "or") one Tylenol Arthritis (long-acting acetaminophen), also labelled as Tylenol (acetaminophen) 8-Hour, on the morning of the day of surgery, prior to coming into the hospital or surgery center for their surgery. Any brand of acetaminophen is OK as long as it is the long-acting version; "extra-strength" acetaminophen is not the same thing and is not the right drug. I place a fast-acting numbing shot into the area of the incision, prior to making the incision. The name of this medicine is Lidocaine, and this way the patient's body never feels the incision and surgery, and they can be given less anesthesia, so they wake up faster and feeling less drowsy. I try to perform the surgery in the least painful manner (we call this "careful tissue handling"). I place a long-acting numbing shot into the area of surgery after the surgical procedure. The name of the medicine is 0.5% Marcaine with epinephrine. This way, the patient can wake up in the recovery room and not feel the surgery at all, in most cases, and they take less pain medicine in the recovery room and go home faster and are less drowsy. After surgery, the patients take Aleve 220 mg or similar antiinflammatory medication, twice a day, AND Tylenol (acetaminophen) Arthritis, three times a day, with a maximum dose of 4000 mg per day, whether they are hurting or not. The dose of Aleve no more than two in 12 hours or three in 24 hours. Taking it wheter it hurts or not keeps a baseline of antiinflammatory medication in their blood, heading off pain before it occurs. Continue this for two or so days after surgery, until they feel they do not need it. Any brand of acetaminophen is OK as long as it is the long-acting version; "extra-strength" acetaminophen is not the same thing and is not the right drug. I ask the patient about their pain when they come back to the office and record this in their chart. This allows me to learn how to do it better. Aleve is a non-steroid, non-narcotic, non-addicting antiinflammatory medication that significantly reduces swelling, inflammation, and pain. Taking this medication greatly decreases the need for addictive, narcotic pain medication after surgery; in fact, in the two studies I did that I mentioned above, 46% (1999 study) and 72% (2013 study) of the patients did not need any narcotic pain medication after surgery. It has been shown that caffeine can interfere with the action of acetaminophen function, so you should try to avoid any caffeine for a day or so. Aleve 220 mg in the morning and afternoon, for about 2-3 days after the surgery; you can stop two days after surgery if your hand does not hurt. Tylenol Arthritis (or any brand of acetaminophen 8-hour), every eight hours, with a maximum dose of 3000 mg per day, for about 2-3 days after the surgery. Tylenol Arthritis plus Aleve is a case of 1+1=3, not 2. That is, they work together as a team to make each other stronger: 2 Aleve or 2 Tylenol is not as strong as 1 Celebrex plus 1 Tylenol (the medical term for this is “synergistic”). (Note that the numbers in this equation are just symbolic: the actual number of pills to take is listed above.) The maximum amount of Tylenol is 3000 mg per day, which is the same as 6 of the 650 mg pills. Remember, don’t subsititute any other medication for the Tylenol: don’t take Motrin, aspirin, or any other over the counter medication. It must be Tylenol (or any brand of acetaminophen) for it to work as a team. Remember as well that Tylenol Arthritis is taken every 8 hours, the Aleve is twice a day. I have found that this program is very effective, keeps the patient informed and in control, and provides feedback to me so that I can continue to improve. If you are considering surgery, please discuss this program with me. I have asked several patients to write about their pain and their post-operative experiences. I chaired a Symposium on Post-Operative Pain for the American Academy of Orthopedic Surgeons. Click on the link to read the newspaper article about the Symposium. Click on the links below if you would like to read what some patients have written about their experience having surgery: carpal tunnel surgery, distal radius surgery, Dupuytren's surgery, gamekeeper's thumb surgery, ganglion cyst surgery, trigger finger surgery.